Sierra County is by and large a ranching community. For many locals, caring for livestock is a regular part of life, and in season, weekends are devoted to rodeos, roping competitions and gymkhanas (a.k.a. omoksees, a.k.a. rodeos for kids). Private lessons for beginners, Dressage classes, and boarding are offered at Enchanted Horse Dressage. A fully immersive trail riding experience is available at the Geronimo Trail Guest Ranch, just over the Sierra County line, near Wall Lake in the Gila Wilderness (map/directions). Mike Root Outfitters, based in Cuchillo, offers summer pack trips into the Gila Wilderness, accessing territory that can only be reached on foot or horseback (due to the “no motorized vehicles allowed” rule). 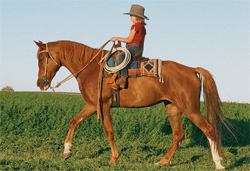 Mules and horses are utilized on these trips that can be booked for anywhere from 2-10 days. Read an article about camping and trail riding in the Gila Wilderness in our press section.